1. 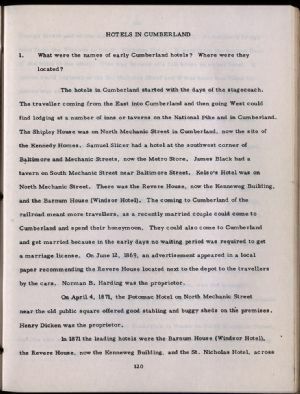 What were the names of early Cumberland hotels? Where were they located ? The hotels in Cumberland started with the days of the stagecoach. The traveller coming from the East into Cumberland and then going West could find lodging at a number of inns or taverns on the National Pike and in Cumberland. The Shipley House was on North Mechanic Street in Cumberland, now the site of the Kennedy Homes. Samuel Slicer had a hotel at the southwest corner of Baltimore and Mechanic Streets, now the Metro Store. James Black had a tavern on South Mechanic Street near Baltimore Street. Kelso's Hotel was on North Mechanic Street. There was the Revere House, now the Kenneweg Building, and the Barnum House (Windsor Hotel). The coming to Cumberland of the railroad meant more travellers, as a recently married couple could come to Cumberland and spend their honeymoon. They could also come to Cumberland and get married because in the early days no waiting period was required to get a marriage license. On June 12, 1869, an advertisement appeared in a local paper recommending the Revere House located next to the depot to the travellers by the cars. Norman B. Harding was the proprietor. On April 4, 18 71, the Potomac Hotel on North Mechanic Street near the old public square offered good stabling and buggy sheds on the premises. Henry Dicken was the proprietor.